One of the primary objectives of the Lake Gaston Computer Club is to provide our members with information, programs, and activities that will improve their computer skills by offering computer classes and technical support. Another objective is to initiate projects in the local community having the same broad goals using the experience, knowledge and enthusiasm of our members. We recognize that our members have different learning styles and computer skill levels, which is why most of our computer classes are conducted as hands-on. Instructors will discuss and demonstrate first, then allow students to try out techniques themselves. All our members are encouraged to participate regardless of their level of expertise. Check our Lake Gaston Computer Class Calendar below for class dates and times. 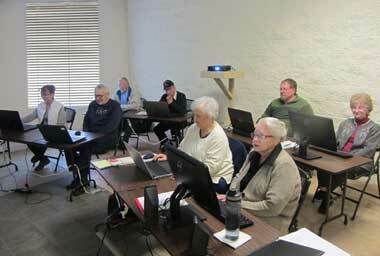 Sign-up sheets for all computer training opportunities are available at all Lake Gaston Computer Club meetings, held the second Tuesday of every month. For Class Location - CLICK HERE. To view all LGCC events - CLICK HERE. For more computer learning opportunities offered locally to the Lake Gaston community CLICK HERE. In this class you will learn how to keep your computer or laptop running smoothly. Learning features and functionality of Microsoft’s latest operating system Windows 10. Mac, iPad, and iPhone SIGs. Click here for more information. Classes in Word, Excel and PowerPoint.